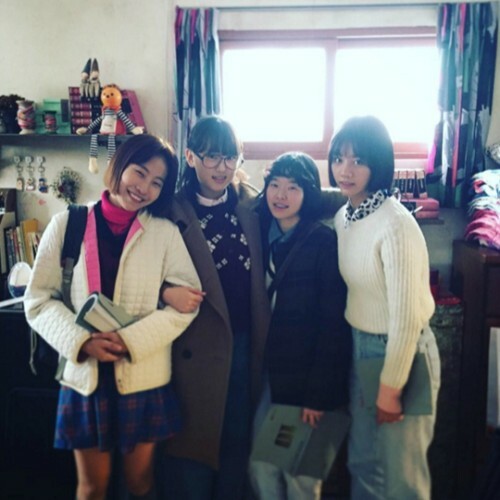 Actress Ryu Hye-young revealed a behind-the-scene photo of tvN's Friday-Saturday drama "Reply 1988." On December 7, Ryu Hye-young revealed the photo on her Instagram. In the picture, Ryu Hye-young, Hyeri, Lee Sae-young, and Lee Min-ji can be seen. She wrote, "#Wang Jo-hyun #Sung Bo-ra #Jang Man-ok #Sung Deok-sun #Reply 1988 #My House #We_will_see_each_other_sometime_right?" The picture seems to be taken while filming the scene where Mi-ok (Lee Min-ji) and Ja-hyun (Lee Sae-young) came to Sung Deo-seon's (Hyeri) house. Meanwhile, Ryu Hye-young, Hyeri, Lee Sae-young, and Lee Min-ji are currently starring in "Reply 1988."